Sometimes I am just not thinking, and maybe my brain is cooking, however I really should have paid more attention. This man has created a bellows; no it is not a bellows, as I do research on this Iron works I am learning as I go. This is going to take work to figure out all this information about what he is doing. I understand, and know, but I am not sure I know all the words to type it into this computer. 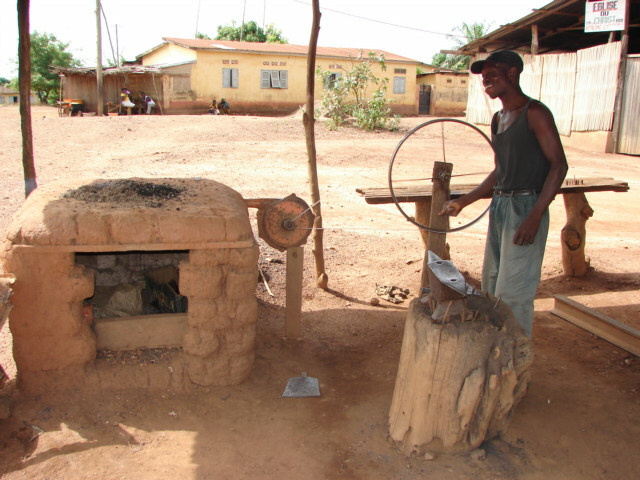 This man is working iron, by super heating the metal over a fire. There is a bicycle rim. Nope, not a bike rim, I think he just made some type of metal hoop with a groove in it, and then either is using a bike chain or a something that has enough bite for the big sprocket to the right to gear up the smaller sprocket and make it spin very fast. To the right in front of the clay box furnace is a fan. What type of fan? I do not know the name, but this one is metal and works by having a spiral type of system. More or less the same as a hand hair dryer used to dry hair, except this one is made of metal so it will not melt. He is cranking the larger sprocket, and stoking the fire by more or less supplying massive amounts of oxygen because the forced air on the flame, thereby increasing the temperature of the flame enough to heat the iron piece until red-hot. 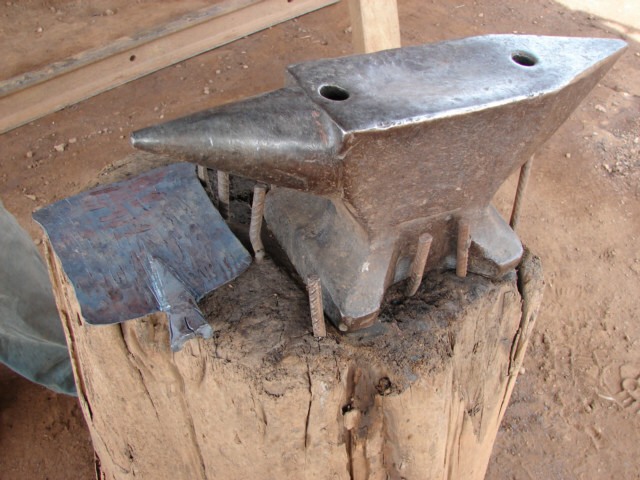 He will then take some metal thongs and put the piece of iron on the anvil and hit it fast and hard to shape in this instance into a hand help plow, mattocks or tool we do not have in the USA. The more or less plow field with it, not plow, they use it like a hoe and pull at the ground until they turn the ground over. To the left of the anvil is a piece of flat iron that shows marks of shaping, this is the only think I truly focused on, just to check what he was making. I suppose I understood the other apparatuses and did not focus, mainly because it is not a complicated set up, straightforward and easy to make if you understand the whys. However, my brain is heated, I knew I was going to explain this, and to explain, it would have been better to look at all the pieces closer and try to think of their names. I enjoy this type of tourism most, cost nothing and to me is the most authentic and valuable type of tourism. I enjoy learning how people live and work. I looked up some of the words up in the Encyclopedia and it focused on Art. This is tools, real life, art is secondary to tools, and the world keeps making art first in line, they buy the art and call it culture, I meet this person and think this is culture. I was disappoint as there was little discussion of tool making. There was also another thing going when I took this photo, not everyone appreciates a white guy just coming up and taking a photo. This person was great, however the arms on an ironworker are not to be ignored, even in the USA. I think the man is using number 8 one-half inch rebar, I think, been a long time to shape into tools. It is the bar that a person puts in concrete to reinforce, the standard size, do all. I need to come up with a good name for tourism where a person goes and learns how a person works and lives, focusing on the work part.